The Tri-Clamp® Elbow x Hose Barb Fitting is the perfect solution for getting into piping systems that are on a bend. 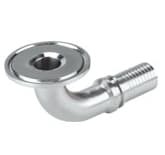 This elbow fitting is available in 90˚ and 45˚. Step up and step down elbow fittings in all sizes. Long Barbs are used for PTFE lined and FDA Rubber Hoses. Short Barbs are used for Silicone and PVC Hoses.